Visible light ranges from red through yellow and green to blue and violet. 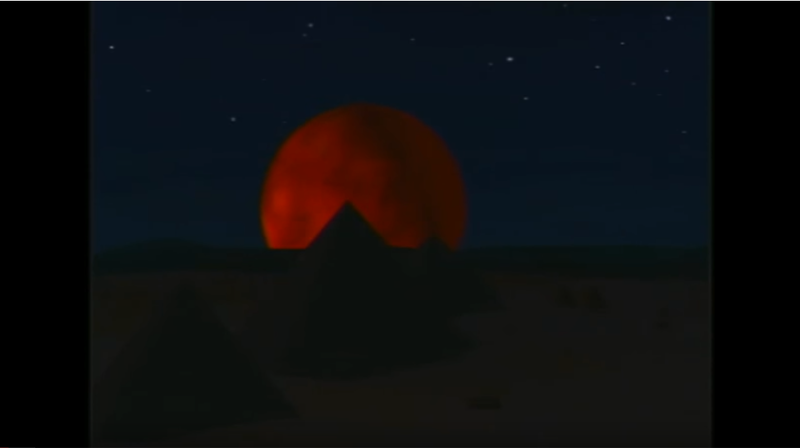 Newton was the first to discover that white light is a mixture of all the colors. White light can be split into its component colors by diffraction through a prism, which ‘bends’ each color by a different amount. 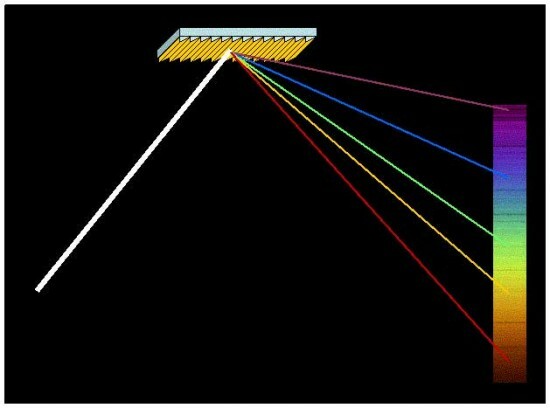 A diffraction grating is often used in astronomy because tiny or dim light sources suffer less energy loss in reflecting from a hard, ruled surface than is lost traveling through a glass prism. Eventually, Maxwell, who defined the Electromagnetic Field equations, proved that light was in fact made up of electromagnetic (EM) waves. Each color of visible light has a characteristic frequency and wavelength. As with all waves, the product of frequency and wavelength give the velocity of the wave. Obviously, light travels at the velocity of light, but Maxwell was able use his equations to shown that all electromagnetic waves travel with the velocity of light, and so light must also be an electromagnetic wave. Visible light represents only a small part of all the possible frequencies or wavelengths. 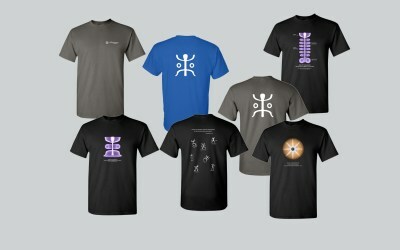 The whole range is known as the electromagnetic spectrum. Although the spectrum is continuous, each region of the spectrum has been named after a typical type of wave for that part of the spectrum. 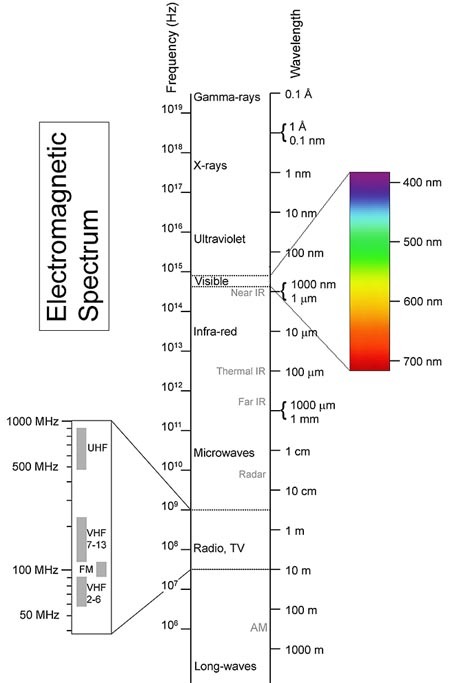 Starting with the lowest-frequency, longest-wavelength waves, the spectrum runs from radio waves through microwaves (as in ovens), terahertz radiation (a recent development in military communications), infrared (as in heaters), the visible spectrum (Red, Orange, Yellow, Green, Blue, Indigo, Violet), ultraviolet (tanning and forensic lamps, materials analysis), X-rays (internal medical images), and up to Gamma rays (cancer treatments). The spectrum is shown in the following diagram. Note that the visible spectrum is only a small part of the whole spectrum. When the Gravity Model was formulated, scientists could only see visible light from the heavens. In the 20th century, and especially since the start of the Space Age in the 1950s, instruments have been developed which allow scientists to detect virtually all wavelengths. The amount of information available has increased exponentially. 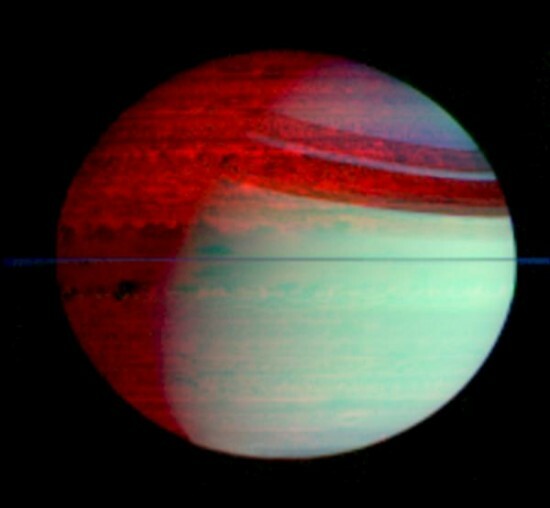 Observations are often surprising because what is seen in the visible is seldom anything like what is found at other wavelengths. Radiation is the process whereby energy is emitted by one body, transmitted through a medium or through space, and eventually absorbed by another body. The emitting and absorbing bodies can be as small as individual atoms or even subatomic particles like electrons. Electromagnetic waves are the means whereby the energy is transmitted. In other words, all radiation is electromagnetic. This means that the mode of transmission of radiation involves oscillating electric and magnetic fields which carry the energy similar to the way that vibrations on a string carry energy along the string. Since the speed of transmission of vibrational energy is constant for a given medium, and that value is equal to the frequency of the vibrating wave times the wavelength (frequency times wavelength = velocity), if you know the frequency one can solve for the wavelength at that frequency, and vice versa. The spectrum represents the range of possible frequencies or wavelengths of the radiation. As the frequency increases, the amount of energy carried by the wave also increases in proportion to the frequency. Ionizing radiation is radiation which carries sufficient energy to ionize atoms. In general terms, frequencies from radio to the visible do not carry enough energy for this, while ultraviolet, X-ray and Gamma ray radiation can ionize. As noted previously, ionization energy varies with different elements and molecules. Radiation is emitted whenever a charged particle undergoes acceleration. Remembering that a change of direction is also an acceleration because the direction of the velocity is changing, then every charged particle that experiences a change of direction will emit radiation. Current theories explain this emission in terms of the emission of a photon, or packet of energy. A photon has no mass but carries the radiated energy in the form of electromagnetic waves. A photon behaves both like a wave and like a particle. Which mode is more significant will depend on the circumstances. 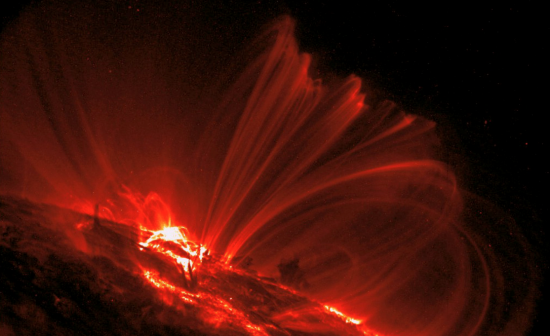 Radiation is emitted by all charged particles undergoing acceleration. All radiation involves electromagnetic waves. The spectrum represents the range of possible frequencies or wavelengths of the radiation. Thermal radiation is radiation emitted from a surface of a body or region of particles due to the temperature of the body or region. Temperature is a measure of the thermal energy contained in a body. The thermal energy causes the charged particles inside the atoms of the body to vibrate in a random fashion. They will therefore emit radiation over a range of frequencies. Similarly, a region of plasma can have a temperature. A proportion of this radiation is emitted from the surface of the body or region as heat (infrared radiation). Actually, all matter with any internal thermal motion radiates EM energy: the colder it is, the longer the wavelength it radiates. Cold interstellar dust will radiate terahertz, or sub-millimeter wavelength radiation, starting at a temperature of only about 10 Kelvin. The graphs show that for any one temperature there is one wavelength at which the greatest amount of energy is emitted. As the temperature increases, the wavelength of the peak energy decreases. This is defined by another law known as Wien’s Law. Note that the red line has a lower temperature and lower area under its curve than the hotter blue line. The area under any one temperature curve gives the total amount of energy emitted at that temperature, per unit area. The total energy emitted per unit area depends only on the temperature. This is known as the Stefan-Boltzmann Law. If the pattern of emitted radiation from any source is distributed in the form given by Planck’s Law, then the emission is assumed to be due to random thermal movements of particles in the source. We then say that the radiation is thermal radiation. All this means is that the radiation has a distribution of wavelengths or frequencies which come from the random thermal vibrations of particles. The radiation itself is electromagnetic radiation like any other radiation. 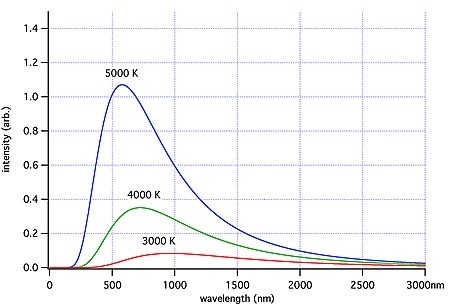 If we find that radiation is thermal, then we can determine the temperature of the source by comparing the emitted radiation curve to the ideal ‘Black Body’ curves. This means we can determine the temperature of distant objects if the radiation they emit is thermal radiation. 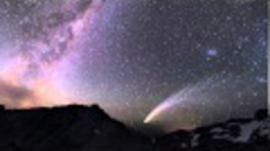 Stars have been found to have a spectrum which approximates a blackbody distribution, so the color temperature of stars can be inferred from their spectra. 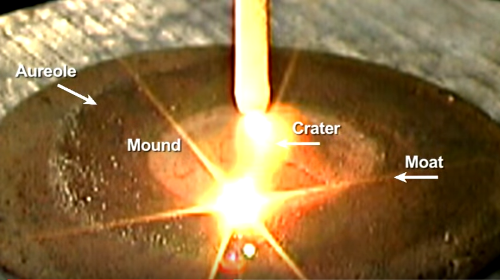 Non-thermal radiation is simply radiation which is not emitted in a thermal pattern. It must therefore be generated by other methods than random temperature-induced motions of the particles in a system in thermal equilibrium. That is not to say that temperature cannot play a part in causing these other patterns of radiation; it is simply that the system or body that is emitting the radiation is not in thermal equilibrium. In other words, energy is being exchanged with the system so that its temperature is changing with time. This will alter the ideal Black Body pattern of radiation and mean that it is not possible to assign a temperature to the body. Alternatively, the radiation may be emitted by individual particles undergoing acceleration caused by means other than random collisions with other particles. 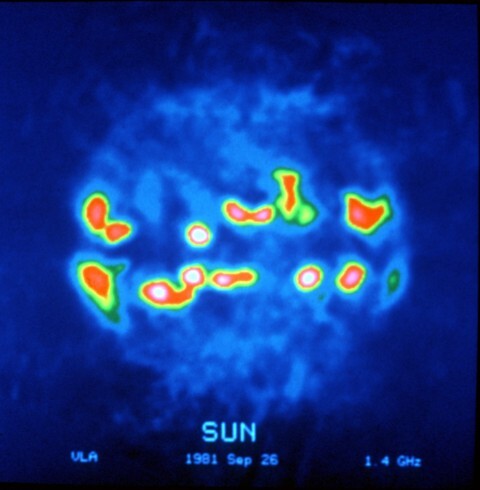 Radiation in the cosmos is common in the visible and radio wavelengths. In the optical region, the majority of radiation is generated by electrons jumping to new orbits within an atom (bound-bound transitions), free electrons recombining with ions to form neutral atoms (free-bound transitions) and electrons being decelerated by interaction with other material (free-free radiation). 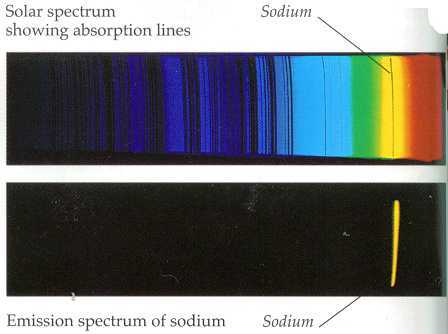 The bound-bound transitions are a source of both emission lines and absorption lines in the spectrum. Each chemical element has a range of energies associated with the range of possible electron orbits around the nucleus for that element. As an electron jumps from one orbit to another, energy in the form of radiation is either absorbed or given off. The energy represents the difference in the orbital energies and so is precisely defined for each possible jump between levels. Because the energy of a photon is proportional to its frequency, these energy differences will result in radiation with a defined set of frequencies for each element. If the radiation energy emitted from an element is plotted for each frequency in the spectrum, then there will be sharp peaks in the graph at these frequencies. These are known as emission lines in the spectrum. On the other hand, if light with a broad range of frequencies passes through a medium containing certain elements or molecules, those elements are found to absorb energy at their characteristic frequencies. The resulting spectrum will be missing those frequencies, and dark lines will appear. These are known as absorption lines. Here is an introduction to blackbody radiation and absorption lines and continuum radiation. And here is more to explore in the broader context of spectroscopy. As an example, if an element is heated in a star’s interior, then it will give off its characteristic radiation which we can detect as bright emission lines on Earth. On the other hand, if broadband light has passed through an absorbing medium between the observer and the light source, then we can determine the elements in that medium by looking for the dark absorption lines. Free-bound transitions occur when electrons are captured by ions and result in release of energy as recombination occurs. The amount of energy released is dependent on the element formed and the orbit that the electron occupies. As in the bound-bound transition, certain frequencies may dominate. Free-free radiation occurs when electrons undergo a non-capture collision with an ion or a charged dust particle in the plasma. The electron’s trajectory will be changed as it passes near the other particle, and so it will give off radiation, some of which may be in the visible spectrum. Radio wavelengths are important because many radio waves can penetrate the Earth’s ionosphere and so can be detected by ground-based radio telescopes. Some radio radiation in the cosmos is a result of the collective behavior of large numbers of electrons in a plasma. If the plasma is sufficiently dense, then the electrons can oscillate collectively with a frequency known as the plasma frequency, which depends only on the density of the electrons in the region. These oscillations generate radiation in the usual way. This type of radiation often occurs when a beam of electrons, for example, as might be generated by acceleration through a double layer, passes through a region of neutralizing plasma. There are other radio frequency radiation generating mechanisms where a magnetic field is present. These include cyclotron radiation (where electrons have non-relativistic velocities), Magneto-Bremsstrahlung radiation (where electrons have mildly relativistic velocities), and synchrotron radiation (where electrons have relativistic velocities). Synchrotron radiation is produced by electrons spiraling along the direction of a magnetic field, such as occurs in Birkeland Currents (image in 11.3 above). The centripetal acceleration causes the radiation. Again, the radiation can occur at all frequencies across the spectrum. 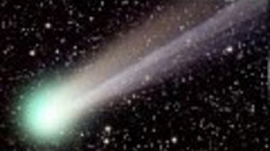 In astrophysics, non-thermal radio emission is, in most cases, synchrotron radiation. This is true for galactic radio emissions, supernovae envelopes, double radio galaxies, and quasars. 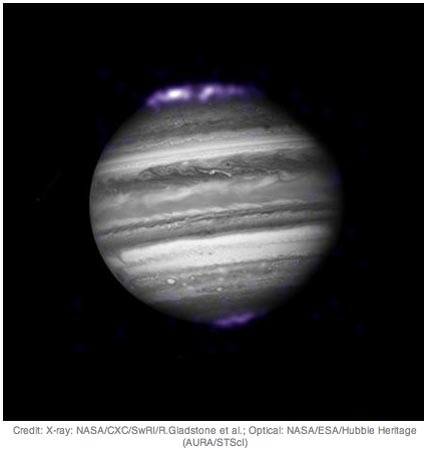 Additionally, the Sun and Jupiter both produce sporadic synchrotron emissions. Synchrotron emission can also generate optical frequencies, such as are seen in the Crab Nebula and the M87 ‘jet’. The Crab Nebula (short YouTube video) also emits quantities of X ray synchrotron radiation. The analysis of a synchrotron spectrum can give information on the source of the relativistic electrons, which may have a bearing on the origin of cosmic rays, X rays, and Gamma rays in space. 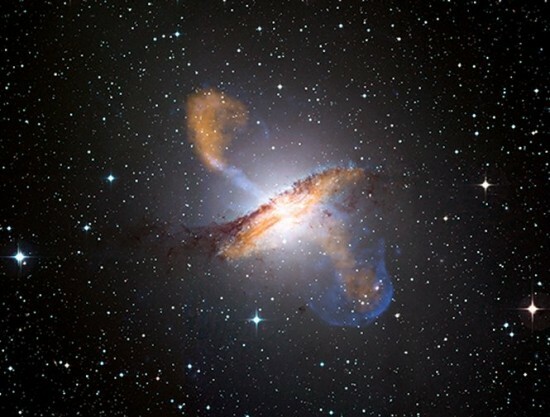 Synchrotron radiation is also evidence for the existence of extensive magnetic fields in space and for the conversion, storing, and releasing of large amounts of energy in cosmic plasmas, including galactic jets. More details on synchrotron radiation here for the interested explorer. Z-pinches can also generate synchrotron radiation as a result of the v × B force. 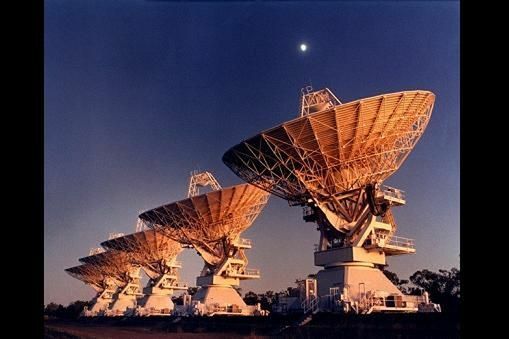 Radio astronomy can therefore extend the range of information available to us well beyond that derivable from visual telescopes alone. Detection of higher energy spectra such as X-rays can take this knowledge a stage further. 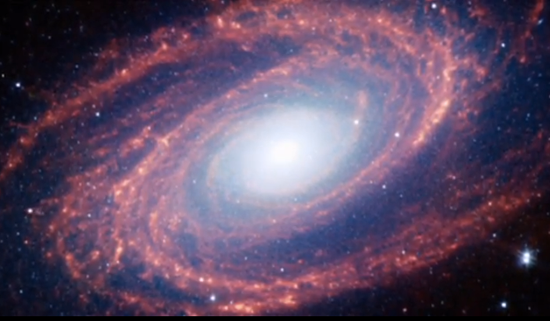 A short NASA video on this galaxy is here, although the EU does not speculate about black holes’ causing galactic jets and their resultant radiation. In all cases we find that plasmas and electric currents within them are excellent emitters of radiation because, as we have seen, electricity in plasma is extremely good at accelerating charged particles, via the electric fields across double layers, which particles then emit the radiation. Interesting research arXiv article posted here. This efficient production of radiation by electrical mechanisms seems to be a much more likely source of most of the radiation detected in space than are the huge amounts of Dark Matter and super-dense matter necessary to explain particle acceleration using only gravity. Of course, ‘magnetic reconnection’, the alleged breaking and reconnection of magnetic field lines, is also often invoked to explain this type of evidence in the Gravity Model. As we have seen, this is simply impossible because magnetic field lines don’t have a physical existence any more than lines of longitude do.